Quick Disclaimer: If you are suffering from any disordered eating and find yourself commonly in a restrictive food mindset or other disordered eating food habits than this post isn't for you. We are all about promoting a healthy lifestyle, but that means moderation and listening to your body, which can get really tricky when you get into a pattern of all-or-nothing thinking about your food. The easiest way for me to explain why we ditched oil is that it falls into the processed food category. When we switched to an entirely whole foods based diet that meant no more chips, candy bars, frozen pizza, soda, and obviously no animal products etc. One of the processed foods that most people know to demonize is sugar, however oil is just the same - a heavily processed food that is completely unnatural for the body. Like sugar is made from a whole food - sugarcane, oil is made from whole foods like olives, corn, soybeans, etc. Usually oil is made using high heat, high pressure, and chemicals to extract the pure fat. This processing takes with it all the fiber, minerals, phytonutrients, and health benefits of the plant. In fact, oil is the most caloric dense food on this earth, coming in at a whopping 4,000 calories per pound compared to vegetables that are only about 100 or beans at 600. Our bodies are not built to ingest a 100% pure fat source. I feel like growing up, I heard so much about the health benefits of the Mediterranean diet. A glass of wine every night was now something to enjoy and eating fish regularly could lower bad cholesterol. Olive oil was the key to heart health. However, after reading about the dangers of oils, I was a bit confused. How could such different information be circulating? So I think it is best we take the parts of the diet that are most health promoting - an abundance of fruits vegetables, and legumes - and ditch all the rest! Don’t get me wrong, I love coconut oil. I put this stuff all over my body to relieve dry skin in the winter, use it as a low-level sunscreen in the summer, and even regularly use it for oil pulling. However, I no longer cook with it even though we’ve been told it can do everything from cure Alzheimers to prevent high blood pressure. 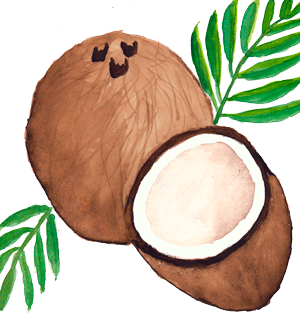 Coconut oil is one of the rare plant-foods that is high in saturated fat, similar to beef or lard. At 90% saturated fat, coconut oil is actually higher in saturated fat than butter. And with none of the super healthy omega-3 fatty acids that our bodies need, coconut oil might be one of the most falsely advertised health foods out there. I mentioned earlier that we follow the Paddison Program, a guide by Clint Paddison on how to cure your Rheumatoid Arthritis naturally. In his guide, Clint talks about the importance of eating an extremely low-fat plant based diet. He references many studies that illustrate how patients who adopt this lifestyle find relief, though if they reintroduce higher fat foods like animal products or even high-fat vegan foods like oil their symptoms can quickly return. And Clint isn’t alone. Another one of my favorite resources on plant-based nutrition is Dr. John McDougall. He has found similar things when reintroducing high-fat foods to those suffering from autoimmune diseases. He has a wonderful post on how arthritis can be cured with a change in lifestyle and discusses the importances of removing all high-fat foods including oil from the diet to see quick reduction in pain and inflammation symptoms. So for us, it wasn’t just oil that had to go. For the first few months in Lou’s healing journey all high-fat foods - even ones that are perceived as healthy - were out including avocado, coconut, and nuts and seeds. I don’t believe that doing something this dramatic to your diet is necessary for everyone. However, if you are suffering from an autoimmune disorder like arthritis, acne, chronic fatigue, or psoriasis it may be worth a shot - you can check out our post on What We Eat if you’re interested in learning more. Ditching oil can be really hard. You’ll have to learn a few new tricks in the kitchen like using water or veggie broth for sautéing your veggies or adding applesauce or mashed bananas in baked goods. You will have to go to restaurants that can accommodate your dietary needs, or in our case just keep your dining out to a minimum. You no longer can grab a Clif Bar when you’re heading out and didn’t have time to pack a lunch. And probably the hardest part, is that you’re going to have to be patient with yourself. It can take a few weeks for your tastebuds to adjust to the lack of fat and those weeks can be difficult. But if you persevere, you’ll find like we did that your health improves dramatically and you actually grow to love the taste of whole foods even more than you ever thought was possible. If you do decide to try life without oil, I would love to hear how it goes for you! Please leave us a comment or send us an email (wildweroam@gmail.com) as we would love to hear how it goes or answer any questions.